This rava laddu recipe I came across in a You tube video where chef Sanjay Thumma explained the process of preparing laddus very neatly and simply, making it easier for anyone to grasp the skill. 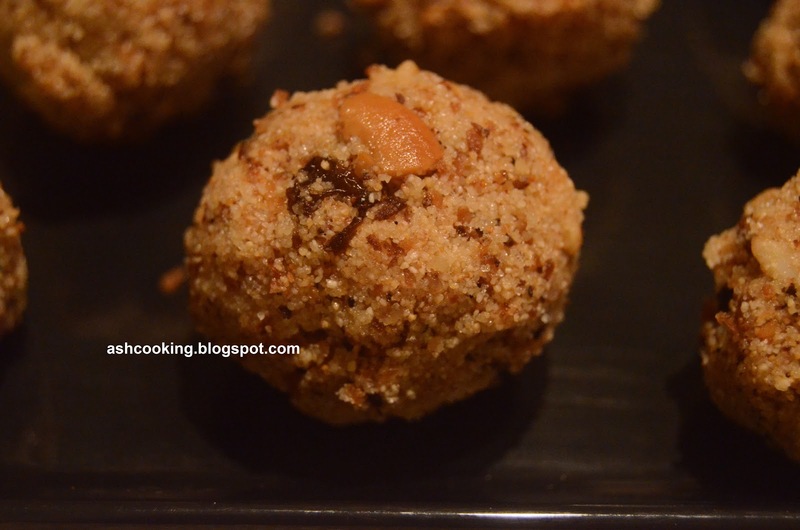 I tried it at home on Diwali and the laddus turned our really yummy. So thought of sharing the recipe in my blog. 1) Heat ghee in a frying pan. Roast the dried fruits - broken almonds, cashew nuts and raisins in the ghee. 2) When the raisins start ballooning up, add the grated coconuts. This will stop the further coloring or roasting of the dried fruits. Reduce the heat to low flame. 3) Saute the coconuts for 1 - 2 minutes before adding up the rava. Once the rava is added, cook it stirring continuously for 10 minutes on low flame. When the rava looks slightly brown in color with a nice smell of roasted rava entering your nostril, add sugar and mix well for 1-2 minutes. 4) Now turn off the heat and add milk. Sprinkle a pinch of cardamom powder. Milk will make the mixture moist so that you can prepare laddus easily and cardamom powder will lend it a nice flavour. 5) Now take a spoonful of mixture on your palm and with light pressure of your fingers, make round balls or laddus.